For many years, my favorite Lightroom gadgets have been the Contour Shuttle Pro v2 and Wacom Intuos Tablets. Can anything knock them off the top spot? We shall see! The Shuttle Pro has 2 dials and 15 buttons, and you can program them to suit your needs, using any of Lightroom’s native shortcuts. You’ll find my favorite settings for the Develop module here. The trick is to float the cursor over the slider you want to adjust (using a mouse, trackpad or graphics tablet) and then turn the dial on the Shuttle, which gives you access to every slider in the Develop module. This is much more accurate than trying to move the slider itself, which improves efficiency. Unlike some of the other gadgets I’ve tested, you can’t access Develop or Local Adjustment Presets using the Shuttle, however since you already have the pen (or mouse) in your other hand, it’s not a problem to simply click in the Presets panel. Some recent Wacom tablets have 6 buttons and 1 dial, which could be used in a similar way, although I generally just use the pen/touchpad. Unlike some of the other gadgets we’ll review, the Shuttle and Wacom tablet are very flexible. You program them to work your way. You’re not limited to a specific screen layout (although you need to be able to see the sliders, of course), and all of the keyboard shortcuts work as normal. 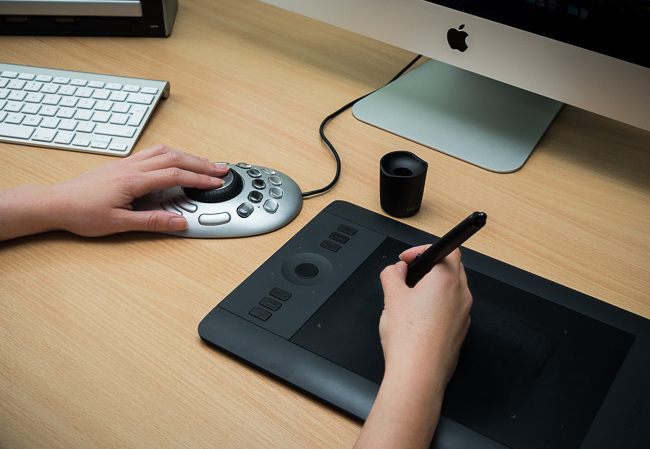 The Contour Shuttle Pro can be used with practically any software on your computer, for example, the dial may scroll in your web browser, change the brush size in Photoshop and change the font size in Microsoft Word, and the buttons can be assigned to different shortcuts in each program. Likewise, the Wacom tablet can completely replace your mouse or trackpad in every application. The learning curve with the Shuttle is minimal, because there are only 15 buttons to remember (and I only usually use the top 9, plus the left and right buttons). The dials couldn’t be easier, because you turn one way to increase the selected slider value and the other way to decrease. A graphics pen takes a little longer to learn to use. I recommend putting your mouse or trackpad in a drawer, at least for a few weeks while you’re getting used to it, as it’s easy to drift back to familiar tools. Some people only use the pen for drawing with Lightroom’s Adjustment Brush or in Photoshop, but I use it for everything, replacing a mouse. The Contour Shuttle Pro has a footprint of only 8″ x 4.4″ (20cm x 11cm) so it doesn’t take up much space on your desk. It’s also shallow and tapers to the desk, so it’s very comfortable to use for hours at a time. Using a pen or pencil is a very natural movement, learned at an early age, so a Wacom pen is also very comfortable to hold for long periods. Some say this can help to reduce RSI issues, often associated with using mice and trackballs, and this has certainly been true for me. 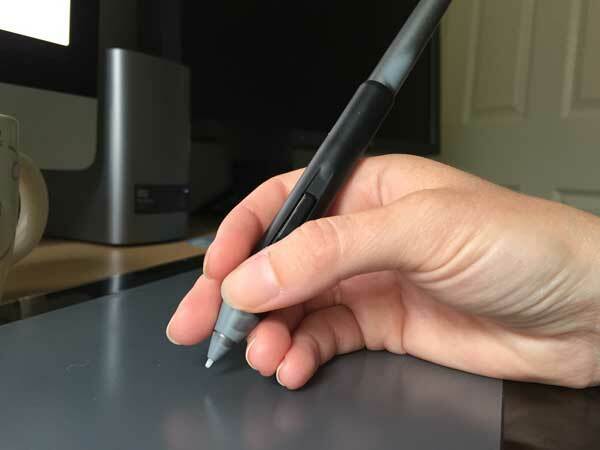 The size of your graphics tablet depends on your needs. I’d recommend upgrading to a medium size if you run dual monitors, but the small size works fine with single monitors. 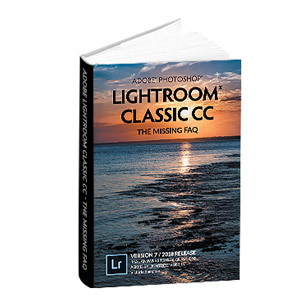 Because these gadgets use Lightroom’s own shortcuts, they work with every Lightroom version and don’t need updating when you install a new Lightroom release. They do require drivers, but both Contour and Wacom are quick to release drivers for new operating systems, so I’ve never run into compatibility problems. Installation of the Shuttle and Wacom drivers is very straightforward. There are written manuals for the Shuttle and videos for the Wacom tablet, which explain how to program the available controls. The Shuttle does come with some Lightroom settings built in, but in my experience, they’re not as useful, so try programming my controls instead. The Contour Shuttle Pro v2 costs around $99 / £87 * from Amazon. As they’re hardware gadgets, trial versions are not available, although online stores such as Amazon may allow returns. * Prices correct at the time of writing. I have been looking at the Wacom tablets for some time, although I haven’t given in as yet. I see you use the Intuos Pro Small. I was looking at the Intuos Photo Pen&Touch Small, primarily because I’m on a limited budget. 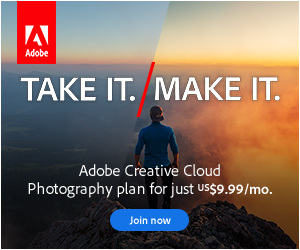 Is that worth the investment for an amateur photographer’s personal use in Adobe CC? I bought one recently and now wonder how I ever did without it! I was like you last year and decided to buy the Wacom medium tablet. Like Victoria says, put your mouse away for a week or two, and you will never use it again. I use my tablet for everything. Do you mind sharing a few settings ? Are you guys using the “Stylus” or “Mouse” mode ? Is there a way to touch the tablet with the pen without doing a clic already ? Just move the pen across the tablet without it quite touching – that’s like moving the mouse – and then actually touching the tablet is like clicking. It’s an “exercice” to keep the pen “quite touching” ! I guess this is the *big* thing to get used to. The mouse is more precise. You’ll find it comes really naturally after a while. The pen doesn’t need to be TOO close to the tablet unless you’re tapping – you’ve got about 1.5cm leeway I’d guess. I’ve attached a picture of my usual grip, although it’s so relaxed you can barely call it a grip. The pen rests lightly on my 4th finger and is held in place with the 3rd. The thumb is only there to tap the buttons. 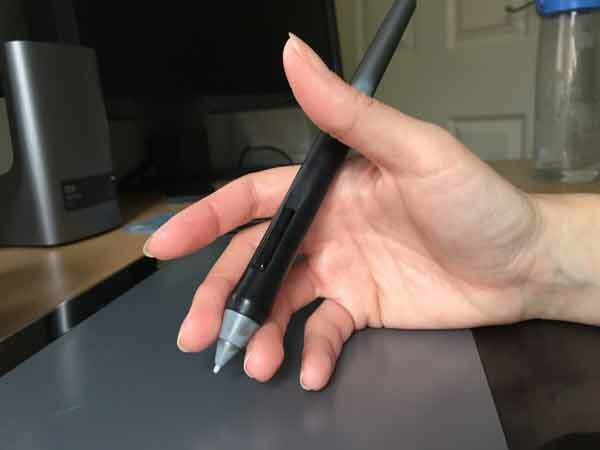 The 4th and 5th fingers keep the pen a comfortable distance from the tablet. Pen between 4th and 3rd, THAT is something I am not used to. I see, I have to experiment. Thank you for sharing ! You’re welcome. It’s more relaxed than a normal pen grip, which makes it comfortable for much longer use, and leaves your thumb free for the buttons. Being a user of a ShuttlePro2 for almost a year now, which I use with a mouse combo (and the ocasional keyboard), I couldn’t understand this part: “you can’t access Develop or Local Adjustment Presets”. When Lightroom has the focus, it is possible to have multiple button settings, one for each main module. So, when I’m in Library module, the first button is for rating one star, but in Develop the same button acts as crop. Then, in Basic panel of the Develop mode, I use the central jog to browse through the multiple settings: exposure, temperature, tint, shadows, etc… and the outer jog dial to change the value of the current selected slider. You’re absolutely right… I should have said Develop PRESETS or Local Adjustment Presets. I started using Lightroom seriously a few monhs ago and I appreciate the tips and tricks I find here. I just ordered your book to have a second point of view. I liked the idea of using this gadget so there is one on my desk now. I need to find my workflow and what works best for me. do you mind sharing your settings how to “browse through the multiple setting” ? I guess there are several shortcuts involved ? That’s an interesting idea! It looks like the Run Macro command than run multiple keystrokes but not switch settings, but if you post it on their forum, hopefully they’ll consider it a feature request. Sorry for the late reply, been out of town on work. Thank you vey much André, I will have a look ! I will need some time to get use to LR and the Shuttle Pro, then I will come back share my settings. I used to have a Wacom tablet. These newer models have way more controls! It’s funny, with all the extra buttons they now have, I still only use the tablet area itself! Victoria, I received the Intuos and Shuttle Pro as gifts last month and as you’ve recommended I’ve put away my mouse. My problem is that my keyboard shelf isn’t really big enough for the new tools and a keyboard so I’m thinking about buying a new desk which will accommodate everything. 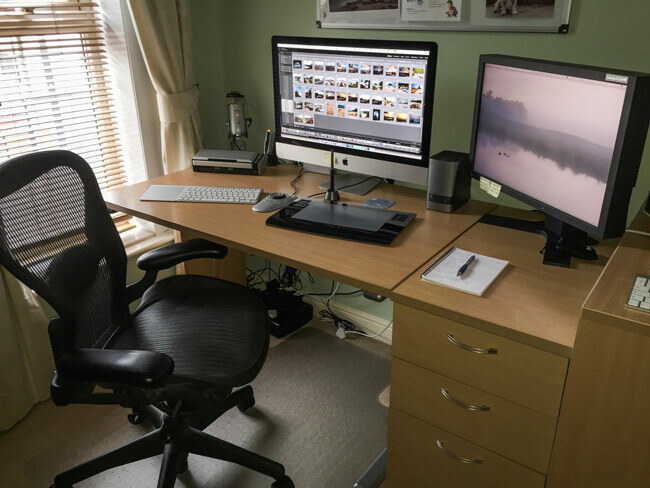 I was wondering if you’d show us what your work area looks like and tell us what desk you use. Thanks. Just updated the topic. If you can add your voice too maybe the will react… ? I’ve already spoken to the product manager and lead engineer about it when they came over to visit a couple of months ago. I am developing an lightroom Plugin to support Contour Shuttle native. Press Shuttle key (or Combination) and Lightroom will be switched to Develop module will turned on. Shuttle layout will be changed to Development layout. Please let me know if you are interested in such addon. Yeah, love to hear about it Andrey. Works for Windows only since I am Windows user and have no Mac, but may be I will find a way how to make in for Mac also. I’m thinking about buying a Shuttle to use along with my mouse. Just curious, when you hover over a slider with the mouse, do you have to click the mouse before the jog wheel will take effect with the slider? Or do you only have to hover to activate the wheel? No clicking, just float the mouse over. You can try it for yourself by floating over the slider and hitting the up/down or shift up/down keys on your keyboard, as it send exactly the same commands.